"You said we would continue digging out the Tyrannosaurus today!" "You LIED about the T-Rex!" My four-year old girl was yelling furiously at me. I tried not to smile - I never envisaged that a T-Rex could fire up such strong emotions (apart from fear) in a kid of this age. Kids do not matter for excuses. Cop-outs simply do not cut it. Hell hath no fury as a young paleontologist scorned. But what sparked this fire for paleo digs in the gentle souls of my young kids? Your hunch is correct ... children's books are to blame. In fact, I really "blame" myself for introducing my twins to a new children's book series. My twins were hammering and scraping a brick of clay in silence for more than an hour yesterday, just because they got hooked on a magical adventure story line. It all started ten days ago, when we read the first of the 9-book Dinosaur Cove series. Dinosaur Cove is a nine-book series published by Scholastic in the US. In the UK - where it originated - it has many more books. The story involves a boy named Jamie Morgan who just moved from a big city with his dad to live in a lighthouse in Dinosaur Cove. Jamie's dad is preparing to open a museum on the ground floor of the lighthouse, which is located near a landslip where prehistoric fossils can be found. As soon as Jamie starts exploring the surroundings, he meets a new best friend - local boy Tom (Thomas Clay) and the pair happen to discover a secret passageway to a prehistoric world filled with dinosaurs. 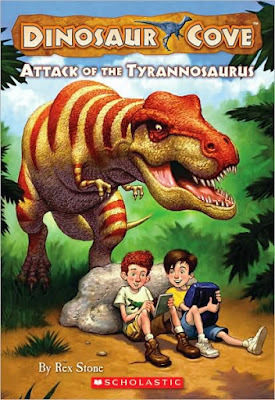 Each book in the series, penned by Rex Stone (which is really a pseudonym for a team of writers including Jane Elizabeth Clarke) and illustrated by Mike Spoor, focuses on one adventure that the boys have in this mysterious Dino World and one new strange dinosaur species that they meet. But the very first dinosaur they meet - a friendly baby Wannanosaurus - becomes an inseparable friend who accompanies them on each of their adventures (at least in the first five book that we read through, until today). In the first adventure, the three friends come face to face with a Tyrannosaurus Rex (T-Rex) that chases after them. In the second adventure, they escape a charging Triceratops (T-Tops), while in the third book they follow marching Ankylosauruses (Anky), and so on. Hard facts about the dinosaurs are presented via the "Fossil Finder" and the accompanying maps and fact files add to the appeal of the book series. By the time you reach the ninth book, your kid(s) will become Dino experts of the first order. Herbivores, carnivores, dinosaurs or pterosaurs, marine reptiles ... I never knew small kids could know so much about pre-historic animals. How much do they love these books? My twins are raving about them! They do not let me stop reading. Chapter after chapter. Book after book. Sometimes reading aloud is a breeze. 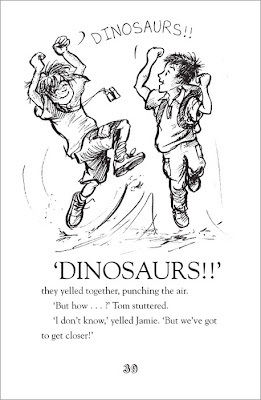 The suspense builds as Jamie and Tom enter Dino World in each new book to have a new adventure or to discover answers to questions that plague Jamie's dad (who is setting up a dinosaur exhibition). 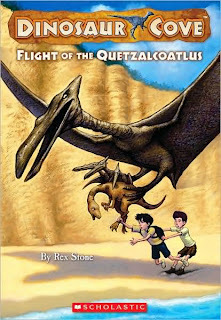 Once Jamie's dad asks the boys to research (in books) where does the Quetzalcoatlus nest (in the jungle, on mountains, near the beach...) - and the boys simply slip into Dino World, which they reach through a passage located in a cave near Smuggler's Point. They find out that the Quetzalcoatlus nests on cliff tops. But the boys keep Dino's World a secret from grown-ups. My kids asked me repeatedly why don't they tell Jamie's dad or grandad about Dino World. They are curious about the secrecy. I keep telling them that grown-ups would ban the kids from returning, or they would capture the dinosaurs for a circus or who knows what... But I don't have a satisfactory answer. The important thing is that my kids love Dino World too. Children adore adventures where the grown-ups are conveniently removed from the picture. Good books are such a fantastic reminder about the power of curiosity in learning. If I tried to tell my kids all about dinosaurs, they would be bored. But by reading good stories about dinosaurs - they simply cannot get enough. 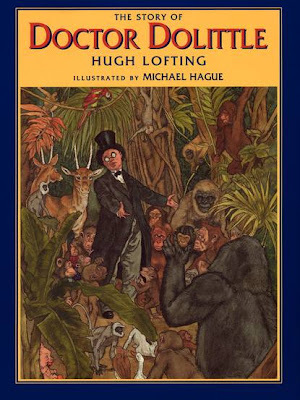 Although Scholastic published only nine of the Dinosaur Cove books in the US to date, the good news is that the original series (which was created by Working Partners Ltd. in the UK and published by Oxford University Press), numbers no less than 20 books to date. 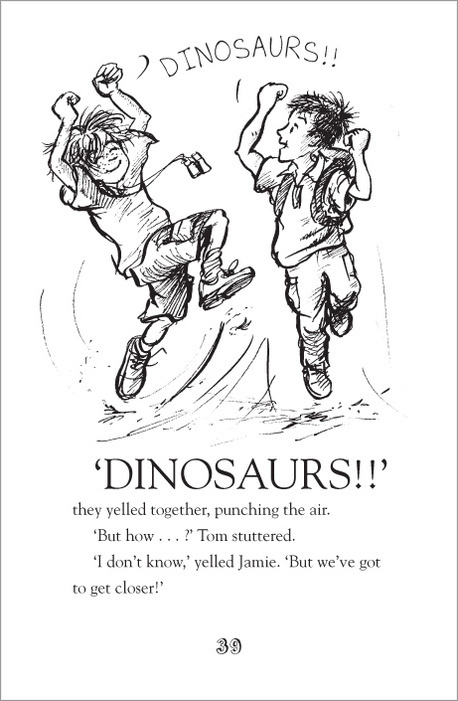 Check out the website of the Dinosaur Cove series in the UK - for more info about Jamie and Tom's adventures/books - that are even classified according to historic periods (Cretaceous, Jurassic, Triassic, Permian!). For example, the UK version of Attack of the Tyrannosaurus is named Attack of the Lizard King, so if you want to continue ordering the series from the UK publisher - make sure you don't order a book that you already have from Scholastic. So we can look forward to at least ten more books in the US (yes, I am looking at you Scholastic). This series - although it contains only black and white illustrations - has a perfect balance of text-and-illustration for reluctant readers. We will be reading them repeatedly, as they are such fun - but I can also see my kids returning to Dino World as 8-year olds, reading to books once again by themselves. By the way, if you ask - yes these books are obviously formulaic. But that is part of their appeal. Kids learn that they can rely on the same structure - from book to book. a. Jamie and Tom meet up in the real world. b. They end up in Dino World. c. They have a "dangerous" adventure with Wanna and prehistoric creatures. d. The boys come back. As each book has around 60+ pages, you will be able to read around 600 pages to your enthusiastic listener without any trouble. Predictable does not have to mean boring in the world of read aloud children's books. We've been reading these without a break, I almost feel like a Readaloudsaurus! Oh my goodness! This is a new series for me- I can't wait to check them out. And I so agree with you about the benefits of formulaic books. I think literary parents worry about them but they are just so great for reluctant readers always and for strong readers in need of a bit of a break. Well, I am so happy that you enjoyed the review. Yep, as you say, formulaic books are great for reluctant readers (and for strong readers who need a bit of a break!). To be good at reading - you need practice. To get practice, you need quantity. Last night we started reading Stampede of the Edmontosaurus. Wow, my kids were bowled over. We read only the first three chapters - and they are completely hooked. I love how your kids are passionate paleontologists! My youngest has also loved dinosaurs since he was 3 (he's 7 now). I wanted to share his list of favorite dino books -- some are too young for your kids but the non fiction might appeal to them. Thanks for the review of the Dinosaur Cove series. I think my son would love it and he's exactly the right age for it! My kids are indeed crazy about dinos! They know all about different species and I have to watch carefully what I say about dinosaurs these days, or else my twins will catch me out if I say that a Velociraptor was a plant-eater .. or that the plates on the back of the Stegosaurus were used for defense. I love your son's fabulous list of favorite dino books - they are mouth-watering! Thanks for the fab list - another incredible list from @2f04fd44b02f5004c4fadc411b33b1aa ! It's so cool to hear from another family who enjoys this series! I can imagine your son going gaga about the series - it seems to be especially interesting for boys (because of the two boy characters). Although, my girl is completely crazy about Dino World as well. What a fabulous idea - to color in a special version of the book. Love it! 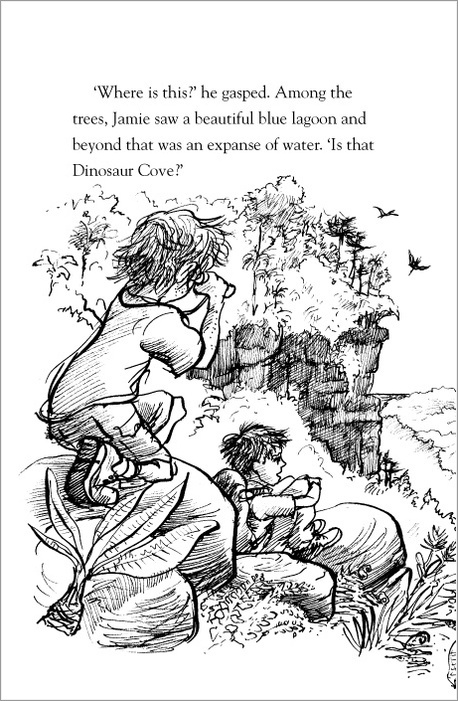 Thanks for taking the time to share your family's experience with the Dinosaur Cove books!